Dogs love toys... but which ones are the right ones? Does it say "indestructible" on the packaging of Rover's new toy? Don't you believe it. Dogs will find a way. It's often about what's hardiest for your best-beloved to sink his teeth into during playtime. There are lots of lovely toys to bring out the inner puppy (in both of you) but (seriously) playthings for pooches are as much of a necessity as they are a luxury. Buy the way, the word "toy" has been around since c.1300. 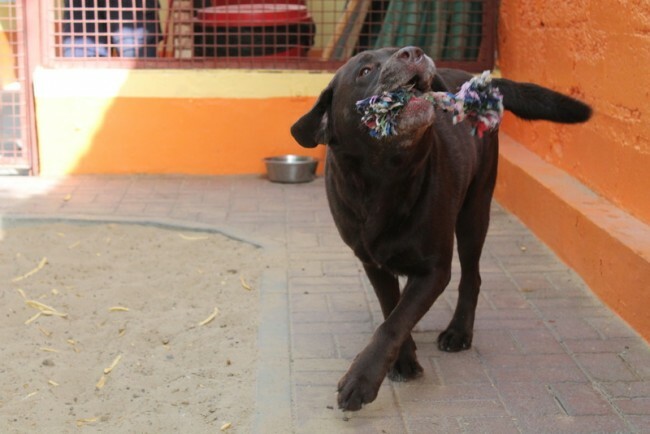 Its first definition was "amorous playing" (you've seen Rover with his favourite rope, right?). Later, it came to mean "piece of fun or entertainment" (c.1500), also spot-on for your pooch and his playthings. But doggie toys also provide comfort and help to keep boredom at bay; they also help you to bond, train and (obviously) give your lil' darlin' the much needed fun and exercise he deserves (okay, yes, demands!). Always good to hit you up with the hazards first, right? Let common sense prevail in terms of your environment, the size of your dog, how often you have playtime, how active he is, age, etc. What Rover romps with shouldn't be small enough to get stuck in his throat or swallowed. Once destruction starts, discard toys that are being eagerly attacked. Dispose of any stuffing, including polystyrene bits, that have come adrift. And that much-loved ball with an ear-piercing squeaker hidden inside? Keep an eye on it; it could be part of Rover's next "search and destroy" mission. While rawhide chewies might be top of the toy list with your pooch, double-check with your vet about what's safe. Some are prone to splintering and there may be choking risks involved. You could try safer alternatives made of (almost indestructible) rubber. Thick cabled rope toys in a bone shape with knotted ends, especially if you have both a Rover and a Fido - hours of watching canine tug-of-war (or whiplash) entertainment for the whole family. The humble tennis ball transforms into a wondrous object - just add dog! Skip the "doggie" balls on offer and invest in some human tennis balls - they'll last longer. Your Nylabone® and Kong®-type hardy plastic toys are the result of years of research on what flips your doggie play-switch. So many varieties to choose from, you're bound to find a soul-mate here for Rover, if only for a few weeks. Rover could develop a bit of a love/hate relationship with his favourite soft and fluffy toy; insisting on having it around but also trying to "kill" it every now and then (perfectly normal in a relationship, as we all know). Not to worry: just make sure it's kinda sturdy (there'll probably be a string of these stuffed-toy romances) and washing machine friendly (big plus)! When we are (temporarily) looking after someone else's best-beloved we get to see, first-hand, how attached dogs are to the toys that come with them. Their "amorous playthings" are what connects them back to you, and keeps them fit, occupied and upbeat until they can be reunited with their real Best Friend Forever (we assume that's YOU! ).